Turkish Salep is a hot creamy drink that warms you up in winter. It is made with milk, sugar and orchid bulb powder. Everyone’s all time favorite hot drink in Turkey. A drink you HAVE TO try before you die! Turkish salep is one of the most fascinating drinks around the world. Its flavor is unique, so no words can exactly describe how yummy it tastes. So rich, creamy and milky that both kids and adults LOVE it like crazy. It is served with cinnamon powder on the top. The best food couple ever! Am I being too assertive? That’s because everyone loves it at first sip. On cold days of winter, it’s almost like a habit for most of us in Turkey to have either Turkish Boza or salep when we are out. Although boza is not served hot, it’s a winter treat too. On the other hand, salep warms both your body and your heart. I love its aromatic scent spreading inside home while cooking it. Let me introduce this interesting hot drink a bit more before the recipe. I was definitely surprised when I first learnt that salep powder is produced from the bulbs of some species of orchid family. You know that beautiful and fragile flower, right? Have you ever thought that it has also a lot of benefits besides its majestic beauty? This orchid family includes 24 species and about 90 classes of orchids. Since the lands of Anatolia are so fertile, these species and classes grow on their own in different regions of our country. However, this unique powder is produced from some particular species. The orchids which are suitable for salep production have a unique structure. The root of those orchids consists of two bulbs side by side. They are in shape of an egg. The bigger bulb feeds the flower while the smaller one works as the spare bulb which will take the responsibility of feeding the flower the following year. Although salep can be produced from both bulbs, producers pick just the spare ones not to cause the flower to become extinct. When the spare one is picked, the bigger bulb starts to generate a new small bulb. The flower survives this way. Fascinating, isn’t it? After the bulbs are picked, they are washed and boiled in water or milk. Then they are dried in open air. The bulbs are pounded when they are totally dried. 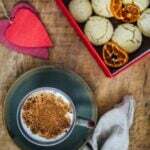 As a result, you have the most amazing ingredient in the world: Salep powder or flour. It naturally includes starch, sugar, and mucilage, which has a sticky characteristic. All these together help the milk get thicker while simmering. Do you know How To Make Turkish Coffee? 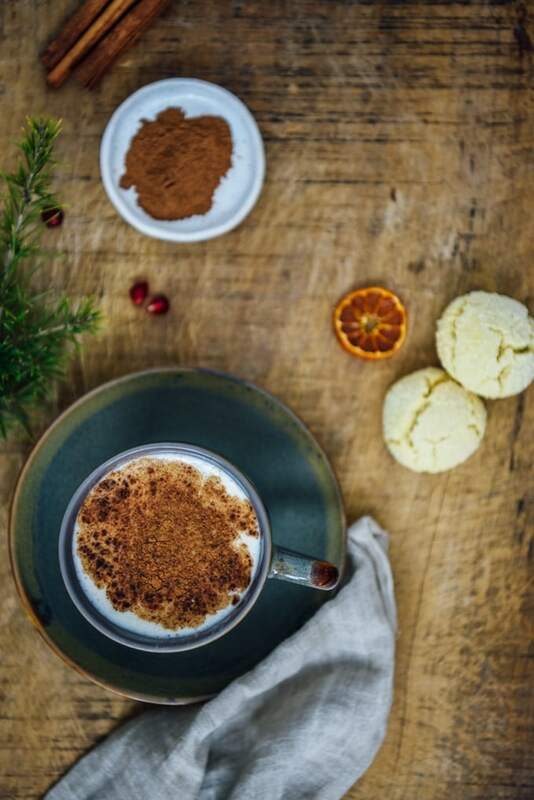 Salep recipe is way easier and you can’t go wrong if you have genuine powder. We need only 4 ingredients to make it: Milk, salep powder, sugar and cinnamon. First, put the milk in a small pot and bring it to boil. Meanwhile, in a small bowl, whisk sugar and salep powder. Add in a few tablespoons hot milk and whisk until smooth. Reduce the heat when the milk boils and pour the mixture into the pot. Keep stirring while it simmers until it thickens. It might take about 15 minutes, but it is worth. The consistency should be creamy like Homemade Eggnog. 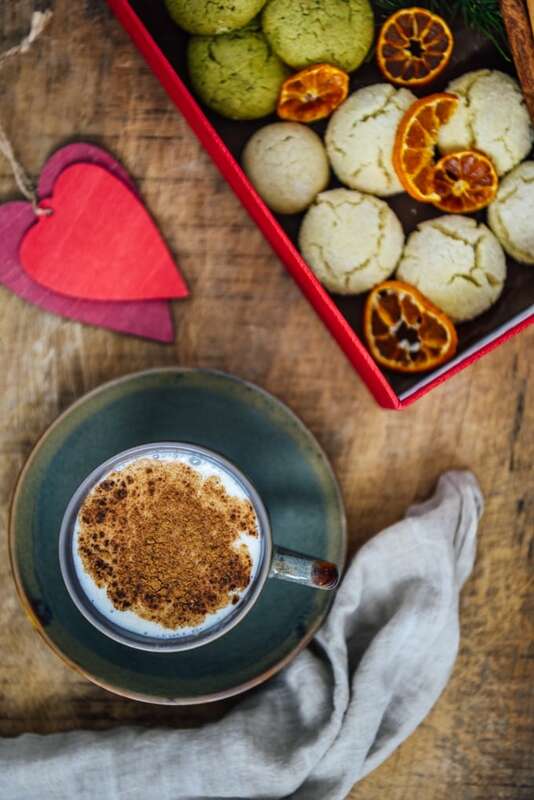 You can serve it in cups or mugs with some ground cinnamon on it and Melting Moments Cookies on the side. Optionally, you can garnish it with nuts as well. You can find it in any spice shop in Turkey. Come visit Turkey to find genuine salep powder! Just kidding. It would be better for sure to buy it from its authentic place, but search for it in Middle Eastern markets if you don’t have that chance. Also, it might be found in online websites that sell Turkish food. It is a bit expensive and that’s how you can understand that it’s genuine. If a kilo of it is cheaper than 250 2000 Turkish Liras (more than $350), it’s not genuine. But don’t worry, you don’t need to buy a kilo. 10-20 grams will be enough for you because you’ll use just 1 tablespoon for 1 liter milk. There are also packaged salep that you can easily find in supermarkets, you just mix it with hot milk like instant coffee and your hot drink is ready. However, these are not genuine, companies add extra starch into it. So if you want to feel the original taste, you should make a little search. What is salep good for? Besides its yummy taste and magical scent, this unique drink has also several benefits to health. The most well known benefit of it is that it has a curative effect on cough, bronchitis and cold, that’s why it’s mostly consumed in winter. In addition, it is said that it cures constipation and strengthens heart and mental powers. Talking on this magical drink, I start to crave for it. I’ll definitely run into the kitchen and prepare some after finishing this post. Oh and if you are interested in discovering more Turkish foods and drinks, you have to try Homemade Turkish Delight Recipe! 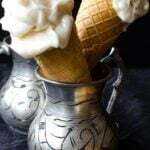 A creamy hot Turkish drink with an amazing flavor that is wonderfully soothing. Put the milk in a pot and bring it to boil. Once it boils, bring the heat to medium low and let it simmer. In a small bowl, whisk salep powder and sugar. Add in 2- 3 tablespoons hot milk (from the pot) and thin the mixture with it. Gradually add the salep mixture in the simmering milk. Keep stirring until it thickens for about 15 minutes. Taste and adjust its sweetness. You can add extra sugar if you like it sweeter. Serve in coffee cups or mugs sprinkled with cinnamon powder. You can put the leftover in a bottle or jar and keep it in refrigerator for 2-3 days. When you crave for salep again, you can re-heat some. Updated: This post was originally published in 2009 and has been updated. It was my obsession when I was living in Turkey. Thank you for the recipe! could you recommend any good quality Salep powder i could buy online? This used to be my favourite drink as a child back in Egypt. I tried many commercial Saleh mixes here in Australia but they were all just cornstarch which tastes nothing like the real thing. I’m so glad I came across your article now I know what to look for. I’ll check a couple of Turkish grocers I know of near where I live in Sydney and hope to find the real powder. I didn’t know salep is popular in Egypt. Hope you can find the real salep in those Turkish groceries.